Hey guys I’ve been super impressed with my 17 canyon until today. The fuel economy has been excellent, the fit and finish of the gmc has been great. All my happiness went out the window today when trying to pull my camper. I have a 2010 Dutchmen TT dry weight is 4600 and the only thing I had in it was about 3/4 full of water and some food so let’s call it 5300. I used an equalizer hitch, and my prev towing experience with this camper was my 3/4 Cummins and I know it’s not even a straight across comparison but damn. On the plus side of things, on the flats it was averaging 15mpg and up steep passes it was getting 7mpg. I’m gonna try readjusting the hitch a little and trying on a relatively non windy day to see if my opinion changes but as of right now I not even looking forward to having to drive it home after we break camp. Did you use the Exhaust Brake at? When did the term "camper" start applying to travel trailers? I use the term camper to mean something that sits on top of the bed. Also, could someone explain how the Exhaust Brake is supposed to work. I've yet to tow, but turning on tow/haul mode, which is supposed to activate the exhaust brake, seems to do little or nothing when going down a steep hill. It was a windy day and were you towing that much weight over 60 mph? Sorry but I can't blame the truck. Which version of the truck do you have? Last edited by 404 Not Found; 04-14-2019 at 11:19 AM. I don't own a 2.8L yet, but when I was test driving them the chevy guy told me you had to press the button to turn it on. I used it while we were just test driving and found it nice to not have to press the brakes, would help with braking while towing greatly... especially on mountains. In regards how it works, the actuator on the turbo closes the fins on the exhaust side, applying pressure on the engine due to lack of space for the exhaust to exit the turbo, turning the engine into a brake. It is mostly used in Semi's to prevent a runaway in the mountains on trucks from brakes overheating, but it became mainstream due to benefits it created and recently been finding its way onto the smaller diesel pickups. Last edited by Storx; 04-14-2019 at 11:24 AM. Well it’s not a toy hauler and it’s not a 5th wheel so maybe terms are getting blurred. Why can’t I blame the truck? My Cummins pulled at 80 and didn’t blink, wind or not. Yes yes this is a MUCH smaller truck, the point wasn’t even the flats, it was the passes when I had the pedal floored and it could maybe hit 50-55mph. I’ve read al these post where guys are saying these trucks pull like the second coming and I’m saying I just don’t see where the excitement came from. If this is too much weight then what’s the cut off? 80% tow capacity? 70% 50% I’m saying I would hate hate to tow any kinda long journey with what I have setup, maybe car haulers with low profile would be a better pull but I tow what I have and so far not a fan. My dash is slightly different than that. 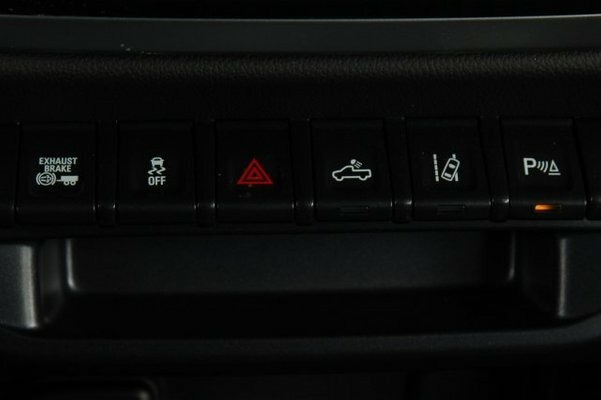 The left button just says tow/haul, but per both the main and Duramax manuals that turns on the exhaust brake too. I just can't determine that it does anything. I'm wondering if you have to have trailer lights plugged in or have it sense a load. My old Subaru Legacy's CVT did more to maintain speed downhill than that button. The number of downshifts selected is determined by the length of time the brakes are applied and the rate the vehicle is slowing. The system delivers the correct amount of braking to assist in vehicle control. The heavier the vehicle load, the more active the engine exhaust brake will be. Maybe it's a combination of my not having anything being towed and they way I brake when going downhill. I don't ride the brakes but instead just push them for a short time to slow down and then release. I had it in tow mode which activates the exhaust break on the down side of the passes. The exhaust break worked as expected and def was a plus. It just felt like the camper was pushing me down the pass instead of all being one unit. Maybe my expectations were too high with this truck. I was hoping for the best if both worlds tow capabilities and good fuel economy. Goodspike, what year and package truck do you have maybe i can point you to it off a truck like yours. It was a windy day and were you towing that much weight over 60 mph? I could see driving into a headwind would make a huge impact. I was driving in eastern Washington once in my old Ranger and the winds were forcing my mirrors back. Just maintaining speed without a trailer was impacted (but that was at 70 mph plus). Has anyone ever towed with a Canyon/Colorado over Teton Pass? I went through there once in a motor-home and my wife will never let me go through there again. If that is the case then you didn't have the brake controller setup correctly, in the past the way i did it, not saying its the correct way, i would pull the trailer to a safe place after hitching up that i could roll to like 35mph and brake safely at, usually grocery store parking lot as my roads in my neighborhood were to short between stop signs..
Last edited by Storx; 04-14-2019 at 12:06 PM. 2019 Colorado LT AWD crewcab. Here is an image from dealership photo, 2019 Colorado LT 2.8L Diesel..
Just want to make sure, you do have the 2.8L Diesel correct? if not then you dont have exhaust brake.. Yes, I have the diesel, but it's not that dash. 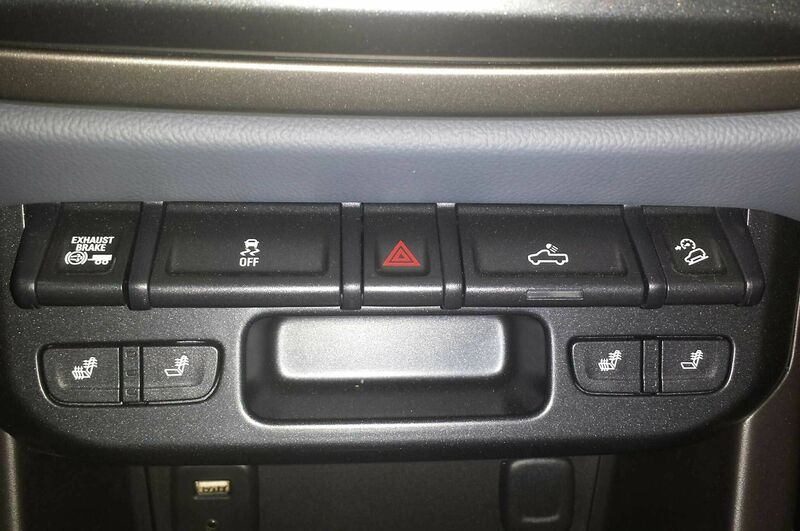 The left button is tow/haul. If the vehicle has a diesel engine, the Tow/Haul button activates the exhaust brake system simultaneously. See “Exhaust Brake” in the Duramax diesel supplement. Yeah, no way your expectations of it pulling like a 2500 with Cummings diesel power was going to compare...it handles a camper like that, but it's not going to do it like a 2500. Add in high winds and you pulling a kite, it's not going to be anything insane. I do fully agree that some on here paint a painfully wrong expectation of what it's like pulling a 30' 8,000# camper through the Rockies. These trucks do fine for what they are, I'm thrilled with mine, but you are correct in assuming you're at a max for feeling great about working these trucks with a camper at 5-6,000#. Suns_PSD, hand foot maneuver, 16WhiteColly and 2 others like this. hand foot maneuver, 16WhiteColly and skitheo like this. Let me once again point out I’m not comparing them side by side, yes the dodge is 3 times what these put out but I’m also not dragging around 12k in weight. Maybe another tow in better conditions will change my mind but as anyone who pulls knows, the weather can be crappy one hour to the next. I guess my expectations were too high from all the “I towed 9k up a 15% incline and got 20mpg” posts that are all over these forums. I know dropping down in truck would have trade offs. I have a 17 foot fiberglass Casita camper. Dry weight is 1900 pounds. My ZR2 Diesel pulls it great, but I can tell it's back there. Flooring it on a long flat straight topped out at about 87 MPH. Trailer brakes help a lot on the downhill. I get about 18-20 mpg. I wouldn't want to pull any more than that for a long distance. So, yeah I'd say 50% of the tow rating if you want to tell people "Pulls it like it's not even there" without lying.